The south east view of St Mary the Virgin's Church at Merton in Surrey. There was originally a Saxon church here which is mentioned in the Domesday Book. A priory and church were founded by Gilbert the Norman in the early 12th century. 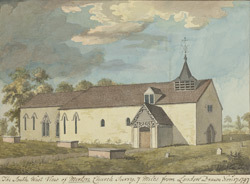 The Priory at Merton became an important centre of the Augustian Order, educating Thomas Becket and Walter de Merton, who later founded Merton College, Oxford. Only a few windows and doorways survive of the Norman church. A larger chancel was built between 1200-30. As can be seen in the picture, the church remains a modest size and has a low elevation.